Prime Minister Hun Sen said that the Kingdom is projected to have a population of about 20 million by 2030 with a growth of 1 percent to 1.5 percent per year and that most of them will be moving to settle in urban areas. Kong Korm, Khmer Will Party’s honorary president, on Monday, wrote a letter to EU Ambassador to Cambodia George Edgar expressing his perspective on the EU’s launching formal procedure that could lead to Cambodia’s preferential access to the EU market under Everything But Arms (EBA). Cambodian Prime Minister Hun Sen has called for joint efforts to combat terrorism to ensure peace in the kingdom, particularly at tourist destinations nationwide. Some areas in Pailin and Banteay Meanchey provinces are facing water shortages due to prolonged drought, though no major impacts have been reported, according to a spokesman for the Ministry of Water Resources and Meteorology. Malaysian-based WA Hospitality has announced plans to set foot in Sihanoukville following the recent signing of a management contract with Cambodian real estate developer Won Majestic to manage the 150-key Won Majestic Casino Hotel & Resort Cambodia, which is under construction and is targeted to open in 1Q2021. The Ministry of Interior has released guidance for banned politicians who wish to request a return to politics after the Amendment to the Law on Political Parties was signed off by King Norodom Sihamoni in January. Science and technology, tourism, infrastructure (road, rail, bridge), and agro-industry are the four key sectors that India is eying for investment in Cambodia to further strengthen and expand the economic cooperation and trade ties between both countries. Senior officials of Germany have expressed their strong commitment to supporting Cambodia, particularly Cambodian Prime Minister Hun Sen, in developing the kingdom’s key areas, according to Eang Sophalleth, personal secretary to Prime Minister Hun Sen.
Cambodia and India are boosting cooperation in human development and trade investment to strengthen relations between the two countries. 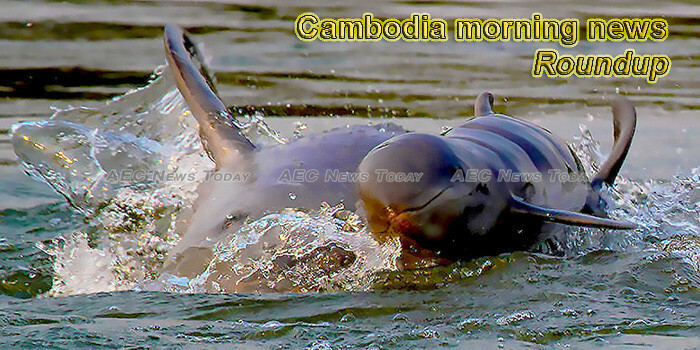 The National Committee for Maritime Security and Preah Sihanouk provincial authorities yesterday called on the public to help protect whale sharks and dolphins present in waters surrounding Sihanoukville’s Koh Rong and Koh Rong Samloem islands. Until the afternoon of February 25, 2019, by the authority of Phnom Penh Police Commissioner, more than 200 people were allowed to return home out of 312 people, including 14 Chinese nationals, who were arrested after a raid in Rock Entertainment Center. An elephant body was found dead with its tusks and tail sliced off in a cashew farm of local people located in Mondulkiri’s Keo Seima district, according to Ministry of Environment spokesman Neth Pheaktra on Monday. Officials from the National Olympic Committee of Cambodia (NOCC) have laid out its strategic aims ahead of the regional Phnom Penh SEA Games 2023 which will be hosted in the kingdom. Siem Reap has been identified to host another prestigious food and beverage exposition 2019, according to the president of Cambodia Tourism Federation. Prime Minister Hun Sen has called on the public not to be panicked and flock to receiving rabies vaccination over dog and cat bites. Meng Leang, the director of the Ministry of Agriculture, Forestry and Fisheries’ Koh Kong department, has rejected allegations by local media that he sold state land, as the ministry investigates the matter. General Secretary of the Central Committee of the Communist Party and President of the Socialist Republic of Viet Nam, H.E. Nguyen Phu Trong, began his two-day state visit in Cambodia this afternoon. Cambodia’s relisting in the “grey list” of the Financial Action Task Force (FATF) on Friday is “unfair”, after the Kingdom met all requirements and was removed from it in 2015, said a source at the National Bank of Cambodia. About 200 people who were arrested in a drug raid at a popular Phnom Penh nightclub often frequented by young people last week have been made to sign a contract promising to seek rehabilitation. The official Facebook page of Prime Minister Samdech Akka Moha Sena Padei Techo Hun Sen of the Kingdom of Cambodia was hacked at around noon. Boats donated to Cambodian Customs and Excise by the Japanese government in Kep Province have captured 1,129 cartons of illegal gigarettes on 25 February 2019, according to a press release. Minister of Information Khieu Kanharith on Friday called on newspapers and radio stations to run corrections to errors made in reporting when requested. Samdech Akka Moha Sena Padei Techo Hun Sen, Prime Minister of the Kingdom of Cambodia, presided over here this morning the commemoration of National Clean City Day 2019 to promote tourism sector. Cambodia has been included on a list of countries “highly vulnerable to money laundering” following reports that show its judicial system has high levels of corruption and that it lacks the will to investigate financial crimes. Prime Minister Hun Sen, on Monday, set five prioritized tasks for Cambodia, preparing her to host the SEA Games in 2023 and to achieve the 2030 agenda for sustainable development goals. Thailand has confirmed it will waive visa fees for Cambodian workers who travel home for Khmer New Year, a press release issued by the Cambodian Embassy in Bangkok states. With most local agricultural exports consisting of raw materials, the Asian Development Bank (ADB) is now designing a multimillion project to increase the value of the agriculture industry. Eight-teen (18) Cambodian U-19 female football players and five officials are going to pay a ten-day visit to Japan, at the invitation of the Ministry of Foreign Affairs of Japan under the JENESYS (Japan-East Asia Network of Exchange for Students and Youth) 2018.